Widely accepted as the gold-standard for ultra low-noise patch clamp recordings, the Axopatch™ 200B Capacitor Feedback Patch Clamp Amplifier is the premier microelectrode amplifier for ultra-low noise patch clamp recordings. The system incorporates capacitor-feedback technology and active headstage cooling for single-channel recording, while resistive-feedback circuitry is used for two different ranges of whole-cell recording. 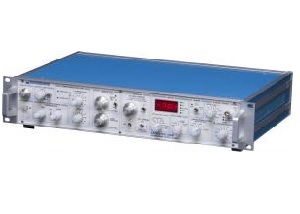 In combination with a Digidata® 1550B Data Acquisition System and pCLAMP™ Software, the Axopatch 200B Amplifier forms the foundation of a patch clamp setup like those used in many electrophysiology labs around the world. Telegraphing between the software and the amplifier ensure correct scaling and logging of experimental parameters. The Clampex Data Acquisition Module, which is part of the pCLAMP Software, makes optimal use of the many advanced features of the Axopatch 200B Amplifier.